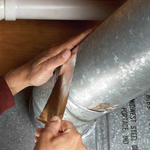 We seal ducts and HVAC systems to increase the efficiency of your home. In homes with forced-air heating and cooling systems, ducts are used to distribute conditioned air throughout the house. In a typical house, however, about 20 percent of the air that moves through the duct system is lost due to leaks, holes, and poorly connected ducts. The result is higher utility bills and difficulty keeping the house comfortable, no matter how the thermostat is set.